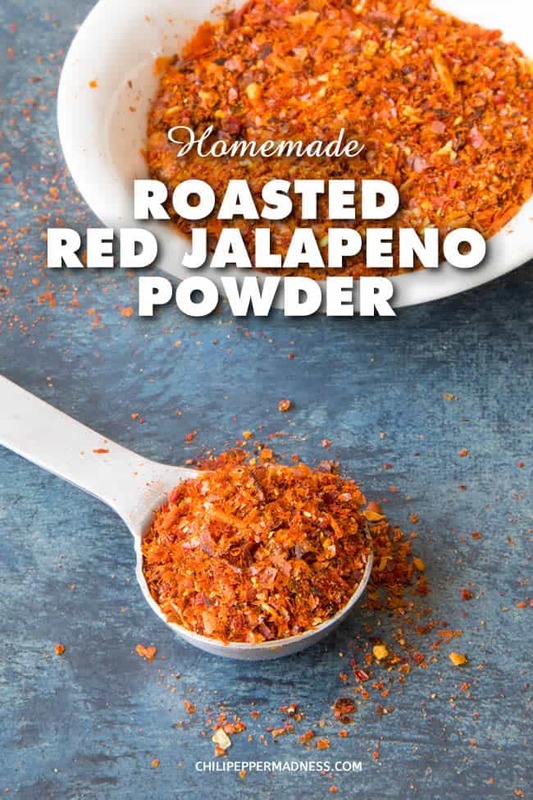 Make your own spicy, smoky homemade roasted red jalapeno powder from the discarded skins of roasted jalapeno peppers. You can also make this from whole roasted or smoked peppers. It’s such a great seasoning. Here is the recipe. This recipe is the perfect example of what you can do when you have a dehydrator, and how many bits and pieces you may normally discard from a recipe can actually turn into something unexpected and amazing. The same applies to roasted pepper skins. 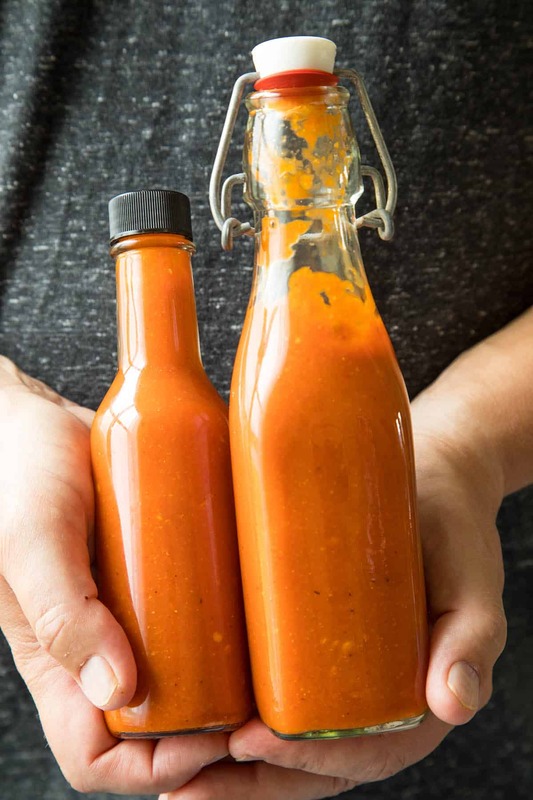 I recently made another batch of one of my favorite hot sauce recipes – Roasted Red Jalapeno Hot Sauce. 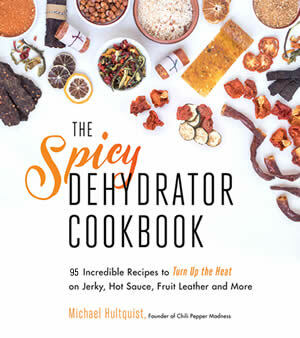 The recipe calls for roasting several red jalapeno peppers, peeling them, then making the hot sauce. This time, I took the skins and dehydrated them. Once they were dried, I ground them with a mortar and pestle and poured them into a spice jar. Done! The flavor is wonderful. It retains that smokiness you get from roasting the peppers and a bit of the spicy heat. Talk about YUM factor. I’ve been sprinkling this stuff over foods all week long. The cool thing is that this seasoning is unique. I have no idea where you can buy this sort of spice. Who needs to? I can make my own! That’s the beauty of owning a dehydrator. 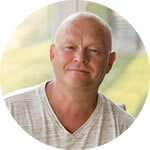 You can make all sorts of spice and seasoning blends to fit your own personal tastes. The world is yours! Go make some seasonings! Roast your red jalapeno peppers as you normally would. 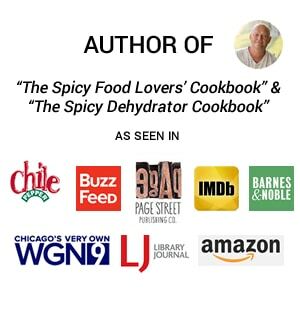 I have information here on How to Roast Chili Peppers. Once the peppers are done roasting, cool them enough to handle, then peel away the skins. It helps to place them into a paper bag or sealable baggie to let the steam loosen up the skins. Spread the charred skins over dehydrator trays and dehydrate them at 125 degrees F for 8-10 hours, or until they are completely dried through. There should be no moisture at all and will be crumbly to the touch. Grind them down in a mortar with a pestle, or add them to a spice grinder and grind them to either a powder or a coarse grain. Store them in airtight spice containers. Use it as you would use any spice. 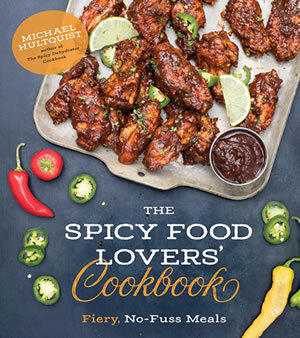 You can make this from whole roasted jalapeno peppers as well, not just the skins. If you want to do it this way, roast the jalapeno peppers as you normally would, but then slice the jalapenos into rings about 1/4 inch thick, then spread them out onto dehydrator sheets. Dry them at 125 degrees F for 8-10 hours, or until they are completely dried through. There should be no moisture at all. Then grind them and use them as you’d like. You can also add in other ingredients, like onion and garlic powder, salt, pepper, herbs, and more. BOOM! 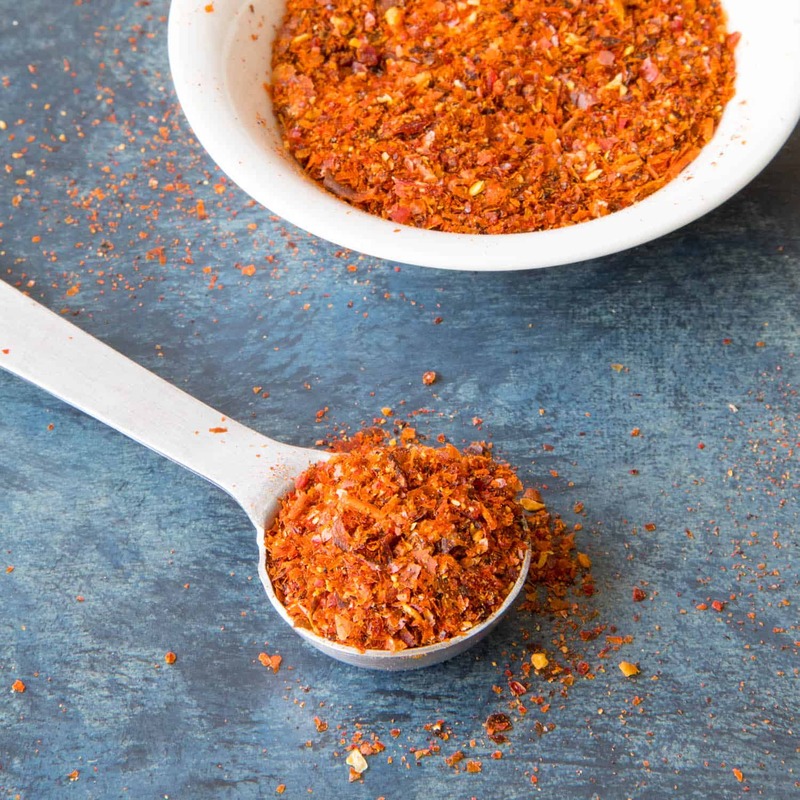 You now have your own personal spice blend. Give it a name! Go sell it for a million bucks! Just don’t forget me if you do! Let me know how it turns out for you! The amounts will vary depending on how much you start with, but the skins from 1 pound of roasted red jalapeno made about 1/4 cup or so of dried seasonings for me. 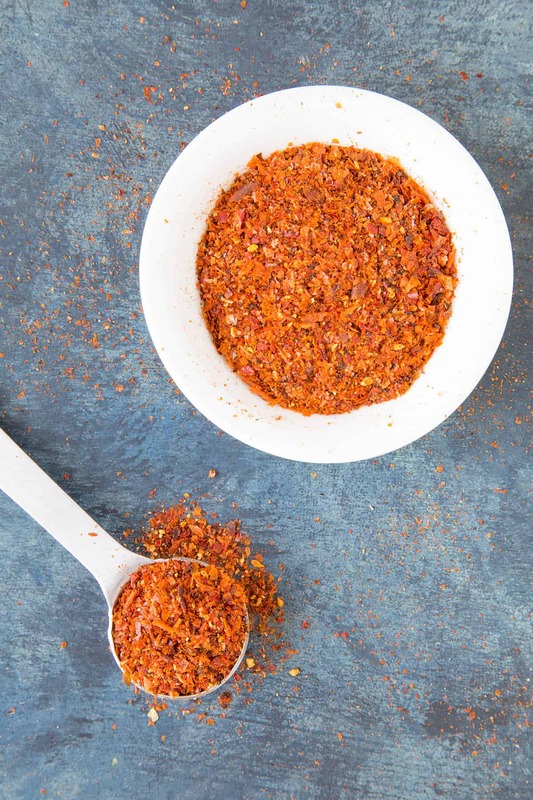 Make your own spicy, smoky homemade roasted red jalapeno powder from the discarded skins of roasted jalapeno peppers. You can also make this from whole roasted or smoked peppers. It's such a great seasoning. Discarded skins from roasted red jalapeno peppers. I used the skins from 1 pound red jalapenos. After you’ve roasted and remove the skins from your red jalapeno peppers, reserve the charred skins. Your amounts will obviously vary. Spread the skins out over dehydrator sheets. Use extra trays if needed. Dehydrate at 125 degrees F. for 8-10 hours, or until the skins are completely dried through. They should be very crumbly to the touch with no moisture anywhere. Grind up the dried mixture with a mortar and pestle, or use a spice grinder. Use as you would any seasoning blend. Makes about a quarter cup or so. Calorie information calculated using 10 whole jalapeno peppers.